When I first came this way twenty years ago, I found this church in a dismal state. It had been abandoned, and was succumbing to the elements. I feared then that it would suffer the same fate as Mickfield, which had been similarly summarily abandoned. Happily, both churches have been saved in quite different ways. 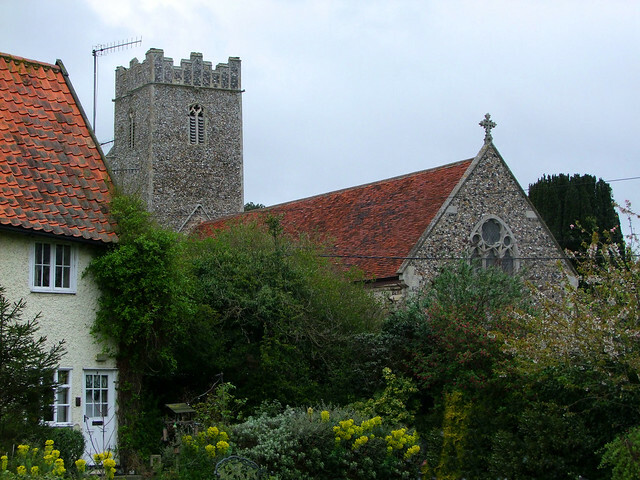 The village takes the form of its name because Suffolk has two Stratfords. The other, Stratford St Mary, is thirty miles down the A12 and no relation. Stratford St Andrew sits directly on the busy road, joined at the hip to Farnham, the main village of the adjoining parish. The tower is tall and plain, with simple decorated bell windows. Their broken tracery suggested to me in the 1990s that the tower has been the subject of some structural movement. A marvellous grotesque looks eastward over the roofs towards Farnham church on the next hill. I saw inside in the 1990s, and found it all dully Victorian, a middle-brow lukewarm ritualist restoration from the 1870s. At some point, a plywood tympanum had been installed in the chancel arch, with curtains below, presumably to create a smaller space for worship. A skein of dust veiled everything. Someone else had been inside recently; a Sainsbury's carrier bag lay on a dirty pew, an interloper from the living world. I came back in 2001 and found that I couldn't get in, because there was a shiny new padlock on the south door. Shortly afterwards, the church was declared redundant. It stood empty for a number of years, but was eventually sold with planning permission to convert it into a private residence, thus becoming perhaps the very last medieval church in East Anglia that this would happen too - these days, the dioceses tend to find less traumatic solutions. There are skylights in the roof, and everything is well-kept. When I thought back to eleven years before, I remembered poking about in the ugly vestry attached to the north wall. Its windows had been smashed, and the door was hanging off on its hinges. Inside, the rusty hooks and a scattering of coathangers were all that remained, apart from an old open chest abandoned on the floor. I thought to myself that there could never have been a right time to build this vestry on the open side of the church; whatever could they have been thinking of? Presumably an off-the-peg job drawn up in some London office. What a sad state of affairs. I imagined the ruin the whole church might become. But today, the building has been saved, and as a private house it stands more neatly and proudly than it has for years. This outcome is a good one for the building, for it could not have survived otherwise. The constant stream of traffic on the busy main road would put me off living here. But I'm glad somebody does.